A wheel that only Cat Mario can spin. 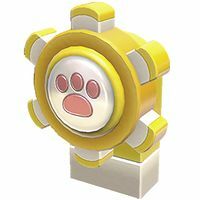 A Cat Wheel is a wheel with a cat paw icon that appears in Super Mario 3D World. These wheels are first found in World 1-3, Mount Beanpole, and can only be spun by Cat Mario via scratching it. This item is similar to the Tail Wheels seen in Super Mario 3D Land. When spun, a number of things may happen, such as a platform rising or a secret area opening. ↑ Musa, Alexander, and Geson Hatchett. 2013. Super Mario 3D World Prima Official Game Guide, page 19. ↑ Shogakukan. 2015. Super Mario Bros. Hyakka: Nintendo Kōshiki Guidebook, Super Mario 3D World section, page 233. This page was last edited on January 12, 2019, at 12:27.